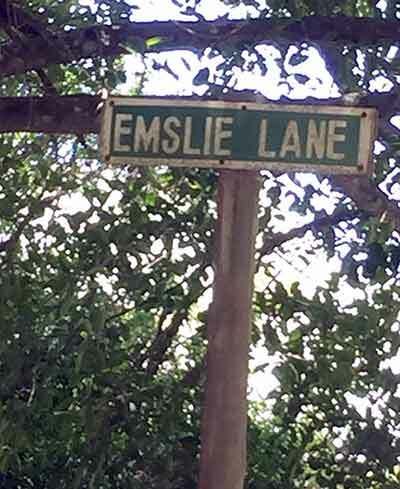 Emslies are originally of the Gordon Clan, of Scotland, from the Aberdeen area. The origin of the surname is from the Old English 'Lea' meaning 'at the Elm, and many spelling variations occurred over the years'. as part of our physical and psychological equipment for the special responsibility which our earthy existence lays upon us. Shield: a Displayed Eagle, Or. Crest: on a Wreath of Colour, a Thistle Proper. 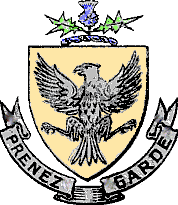 Motto: Prenez Garde ("Always Alert"). The surname may be of English origin, but its earliest recorded use is in Scotland. Admitted as Burgess of Aberdeen in 1498. Residare at Ruthven in 1574. Residare in Cultballoch in 1599. Of Loadhead was the first to systematically quarry granite in Aberdeenshire 1715-1745. • Enlisted in the Gordon Highlanders (75th Foot) 15 October 1789. • Saved the Regimental Standard during the storming of Seringapatam, Mysore, India: May 1799.
on pension of 2 shillings, 3 pence per day. Emigrated to South Africa 1820 with wife and children, and allocated land in Albany between Grahamstown and Port Alfred. After attempting to farm for two years he later became 'chief constable' in Grahamstown. 3. William Kenward Emslie (1816-1894) (son of Sarah Greasley, d.1831), married Amelia Norman. where they are besieged by the Afrikaner Voortrekkers under Andries Pretorius. • A dispatch needed to be taken from one British military unit to the other which were hemmed in by the Voortrekkers. William volunteers to swim the river between them with the message and the siege is ended 26 June 1842. • The transport riders return via sea to Port Elizabeth as their oxen had been seized by the Voortrekkers. 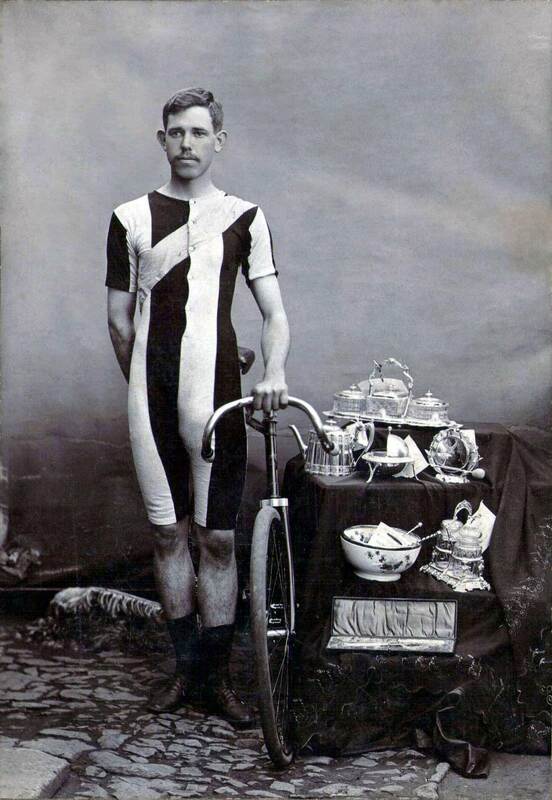 George Gordon Emslie (1846-1906) (son of Amelia Norman of Sevenfountains). See in photo below – fourth from left in the middle row. refuses a commission to serve as lieutenant, and is a comitted member of the local Weslyan church. • In 1896 George is appointed 'Justice of the Peace' for the District of Albany, Eastern Cape. 5. 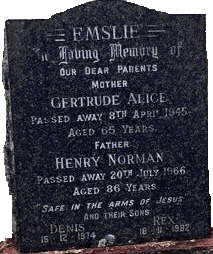 Henry Norman Emslie (1880-1966) (son of Helen Long). See in photo below – second from left in the back row. sister of Rex (1913-1982), Havelock, and Denis Emslie. 7. Lloyd Emslie Thomas (1941-) | Ruth Lydia André | Helen Olive Lee (children of Joseph Reginald Thomas of North Wales). 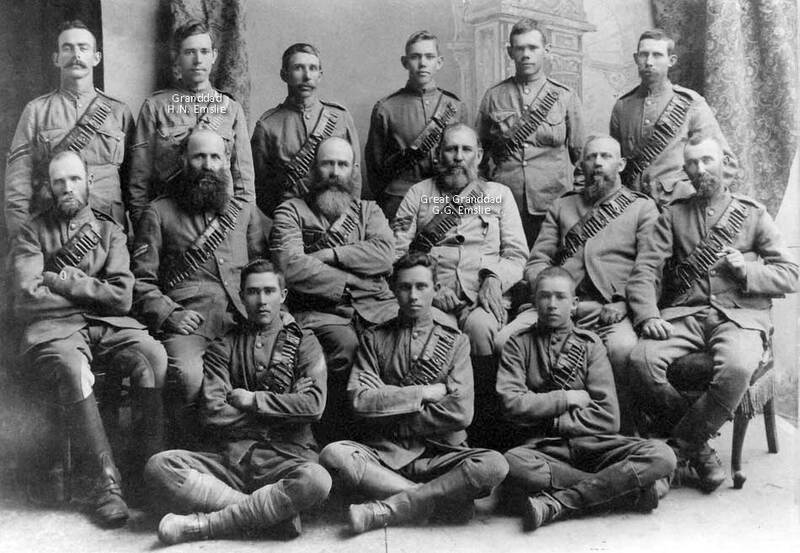 The sons and grandsons of William & Jane Norman in the Albany Defence Force, Eastern Cape, South Africa. Back Row (LTR) – 1. John Samuel Norman, 2. Henry Norman Emslie, 3. Arthur Charles Norman, 4. Edwin Gordon Emslie, 5. Ebenezer Emslie, 6. Percival William Emslie. Front Row (LTR) – 1. Richard Gush (brother-in-law of Ebenezer Emslie), 2. Guy Robert Bradary, 3. Lennox Field.